Yet even though dogs are on par with royalty around Paris, it's not immediately clear where you can and can't take your pooch. I didn't find leash-free areas until very recently - January, to be exact. 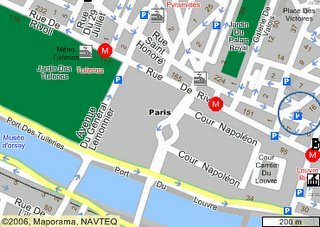 So, in an effort to help my fellow man's best friend, here are maps and directions to two leash-free dog parks in Paris, France. 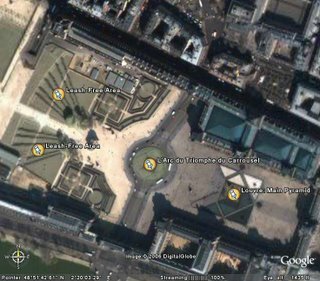 In this map (created with the help of Maporama.com), you can see the Jardin des Tuileries highlighted in green. Dogs can be in *parts* of this garden, but if you go by the officially posted rules, they should be on-leash. (I've seen lots of dogs of all sizes running off-leash there, though.) The spot where you can let your dog run leash-free is the large gray rectangle just to the right of this green space (where the word "Paris" appears in bold). Here is a sattelite shot of it, thanks to Google Earth. The diagonal lines that you can see are tall rows of hedges. The trick to this, however, is that it can get tough to keep track of your dog! So, make sure that your dog either responds well to you calling him, or be sure to have treats to lure him back. I haven't seen any official postings that sanction leash-free play here, but both police officers on horseback and national guard soldiers have walked right past Didge and Sophie off-leash without saying a word. (I've uploaded video proof of our encounter with the latter: Not even a semi-automatic rifle can scare Didge!) Be sure to bring some plastic bags with you to clean up after your dog as needed, as they don't have bag dispensers here. Of course, as a guard at the Tuileries once told Maggie, you don't really have to clean up after them ... but you should, as a good dog owner! 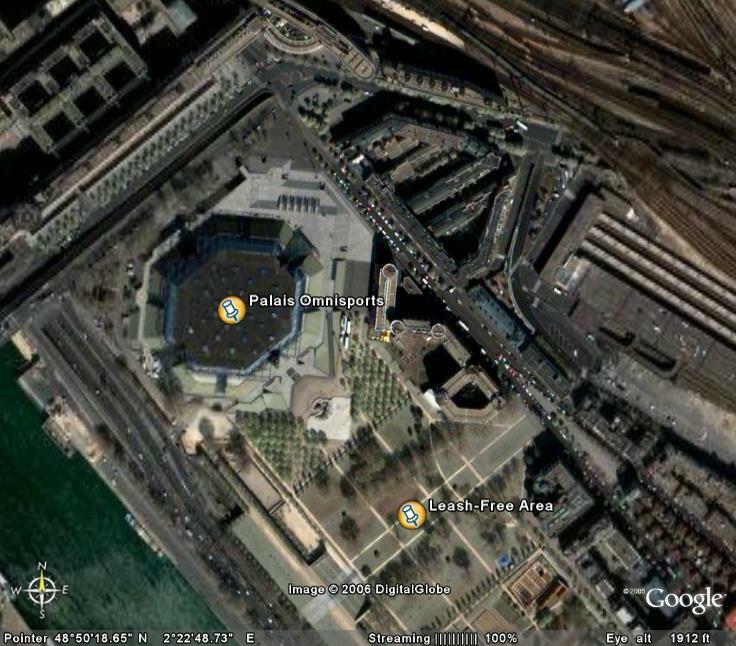 Here, you can see Le Parc de Bercy in green. (Again, thanks to Maporama.com for the map.) The dogs can only play leash-free in the top section - there is a fence that marks the start of the Yitzak Rabin memorial garden, which doesn't allow dogs. No matter - there is plenty of space here for dogs to run around and have a great time. I've uploaded a fairly long video of Didge playing in this park with Sophie. It's not very interesting, but you can get a feel for the space that's there. The best part, in my opinion, is that we are allowed on the grass - a true rarity in Paris. Most grass is "en repose" right now, which means that no one is allowed to set foot on it. In the summer, only people can be on grass: dogs are interdit (forbidden). 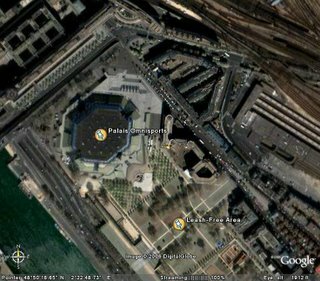 Here is the Google Earth sattelite shot. 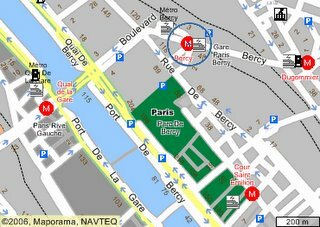 When you get off at the métro stop Bercy, I recommend taking the Omnisports exit. From there, you just go around the arena to the left (you'll have to climb a few stairs, but not many) and the park will be behind there. This is my favorite dog-friendly park in Paris so far. It has plenty of room for the dogs to run, and you don't have to worry about them getting into a spot that they aren't allowed in. 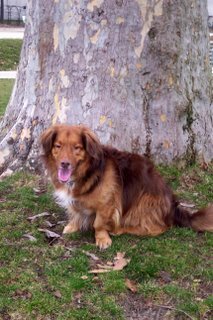 Plus, there are no busy streets nearby, so if Didge started to get away from me, I'd have a chance to get him before he wandered into traffic. I've heard that this park gets really busy in the summer. I'm sure it will continue to be so, especially once the pedestrian bridge crossing the River Seine is completed. That will connect this park with the Bibliotheque Nationale, so it's bound to attract researchers for their lunch breaks. Watch for that to open in October 2006. Of course, you can walk your dog on just about any city street, and if you have a small dog that can fit in a sherpa bag, they can join you on all public transportation. Didge is too big for that option, but it seems to be no problem whatsoever to have him ride the métro with me. (I know it's officially not allowed, but people do it all the time.) Mainly, I recommend avoiding busy times if you're going to do this -- Didge lost a good chunk of tail hair on a particularly crowded car one afternoon in December. Jardin des Plantes, 5e arrondissement - no dogs allowed. Jardin du Luxembourg, 6e - dogs allowed on-leash only in one section along the east side of the park. Watch for signs! They are small and hard to find. There are only two entrances on the east side of the park that dogs can enter, so use those spots as your guide. Parc Montsouris, 14e - yes, as long as they are on a leash and not on the grass. Bois de Vincennes (12e) and Bois de Bologne (16e) - dogs allowed, except for some marked areas. I haven't been to Bologne yet, but the Bois de Vincennes was an excellent place to take Didge. These are the forests (well, woods would be the better word) on either side of the city, and there is plenty of room for dogs to run and explore. We took Didge off-leash some of the time, though I don't remember if it was officially sanctioned or not. Additionally, dogs are allowed in the gardens at Versailles. I haven't figured out if I can get Didge on the RER C line out there, but if so, we're totally going to take him out there sometime! I rememebr that park near the Louvre. I videotaped a mime that, upon review, had already finished his show and was just talking to his wife. I'd highly recommend either the Bois de Vincennes or the Bois de Bologne, the two large wooded "parks" on either side of the city. They are huge, and you don't even feel like you're in the city once you get into them. Most of the times we went there, I saw dogs running off leash, too. The other good news is that you can take your dog just about anywhere, except grocery stores. Most parks are friendly, but you'll want to read the signage to make sure they don't say anything specific about keeping out dogs. Jardin du Luxembourg, for example, has a part where you can walk dogs, but a part where you can't (the no-no part is near all of the beautiful gardens, sculptures, fountains, and the palace itself). I took Didge on the Metro and the RER without incident. If you have a small dog, s/he can go anywhere with you, including buses. (It's best if you have a little sherpa bag for him/her to ride in, rather than having him/her loose.) If you have a bigger dog like Didge, you'll need to have him/her on a leash, and you can't take him/her on buses. The only time I got "in trouble" on the metro was when a police officer told me that I should have a muzzle on Didge because he's so big. So, if you want to be perfectly prepared with a medium/large dog, take a muzzle with you that you can put on if you get yelled at. (I still got on the metro after that officer yelled at me, so I guess it's not really that big of a deal.) Most people are thrilled to see a dog on the metro or RER and will want to pet your dog. The tough part is when the metro gets really crowded -- Didge lost more than a few tail hairs when we were unlucky enough to end up on a crowded car. Thank you! Please keep me posted if you find any more places. I've been trying to find open space for my dog forever! Though technically it's not allowed, the grassy area right in front of Eglise Saint-Eustache (metro Les Halles) is a hugely popular place for people to bring their dogs to run around and play off-leash. Go around 7 or 8 in the evening and you can find a group as large as 20 dog owners amiably standing around chatting while their dogs romp around. It's great! Also, regarding the metro, I've brought my dog with me at least a hundred times and never had a problem. I just have to note that Paris is arguably the best city in the world to have a dog - you can bring your dog pretty much everywhere! I live in Versailles, and its not bad for walking dogs in. The best place is just to the left of the Palace, theres is a park called "Place des suisses" or something along those lines, really nice, but with a lake, so watch out for swimming doggies wanting to get to the swans and ducks! Thanks so much for the information!!! I and my wife Kimberly are Abby's (4 lb furball)humans and she'll be thrilled to visit the places recommended! Tanks for this. are you still in Paris? any updates?